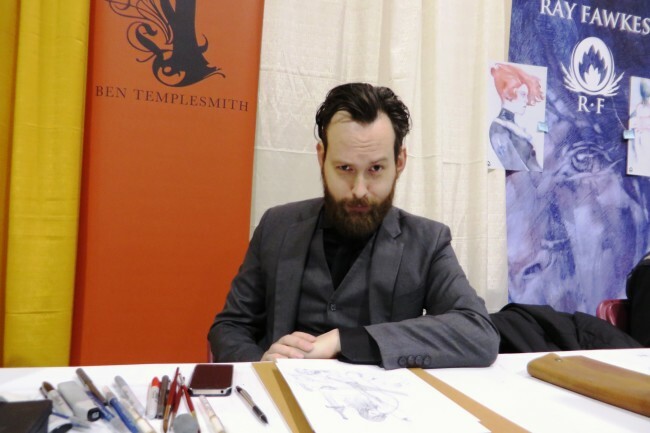 Ben Templesmith, comic book artist and writer. Cinema Spartan: We met you once in San Diego at an IDW event. This was before Groom Lake, so I’m guessing it was spring of 2009. Can you give us a quick primer of what’s happened between then and now? 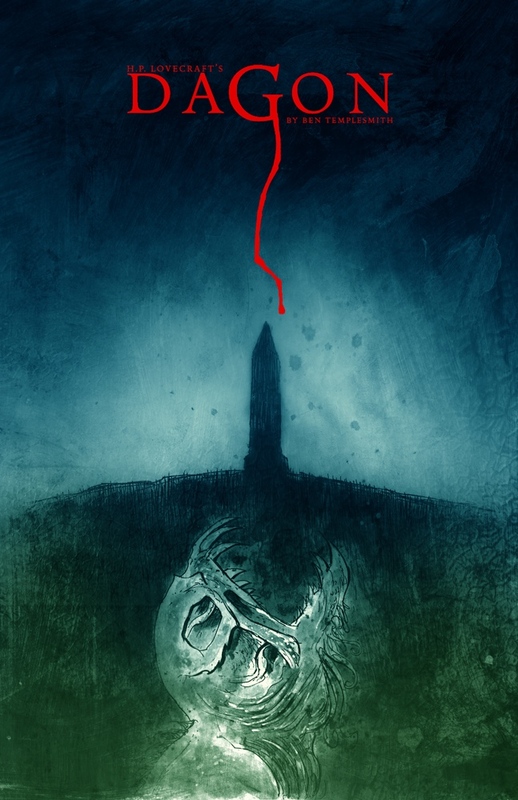 Ben Templesmith: Gods, that was a lifetime ago. Lots of things. Moved three times to different cities, lots of life stuff, learned a lot about self publishing, co-founded 44FLOOD, learned all about Kickstarters and took my creator rights by the horns for the first time in my career — because creator owned often doesn’t mean creator controlled, but now it does for me, finally. I must’ve done Batman: Legends of the Dark Knight, Choker, The Squidder, Dagon, Gotham By Midnight and a few other things since then. Not nearly enough, but I lost a year and a half to the dramas of a sociopathic ex-girlfriend a few years back. I’ve been rebuilding myself and my creativity and productivity ever since. Back when 44FLOOD was being formed, you said something along the lines of 44FLOOD being “artists for artists” without necessarily being anti-writer. Now that 44FLOOD has a few projects under its belt, including Tome and The Squidder, has the 44FLOOD philosophy changed at all? 44FLOOD was the next stage for me, where a few like-minded people came together to do their own thing. We were full of grand plans back then and rather lofty goals. I’ve learned a lot from then until now, as I’d never before been part of a group, rather than just forging ahead with my own ideas. We’re still artists for artists. We still have a great setup really, but now we’re more focused on using the platform we have to do our own projects specifically, as well as bring up some others we’ve come across, since there’s nothing worse than talented folks not getting ahead and potentially losing control of their own work. I’d say our philosophy has changed a little from the early days. We’re a lot more grounded now and making concrete plans for the future instead of being as haphazard as we were. I guess we’ve grown and learned a lot. A mistake is only a mistake if you don’t learn from it after all. At the end of the day we love books and art, so that’s what we’ll do. Dagon by H.P. Lovecraft and Ben Templesmith, 2015. 44FLOOD seems to be hitting it out of the park with their projects utilizing Kickstarter. 44FLOOD ran campaigns for The Squidder, Lust, Tome, Tome 2, and Dagon. How do you find crowdsourcing changes the publishing process? What are the benefits of crowdsourcing versus finding funding from traditional publishers? Well, thanks to amazing people, all those projects went astoundingly well. We did and have learned an awful lot on the fly as we did them, new problems to solve for each. If you’re asking how it changes the publishing process, it makes us the publisher. So we have complete control. It’s rather empowering. Plus you go direct to the people. I don’t really do books just so I can get a royalty check in the mail to pay my rent. I actually enjoy shipping things out, remembering familiar names and getting real people the silly things I draw on paper. There’s much more of a connection to the audience with crowdsourcing. Of course, once that’s done, you can then take things to the much more impersonal “direct market” of comic books via regular publishers (though now with leverage as you have your project done, a publisher doesn’t have to pay you directly to do the book so you’re in a stronger position to negotiate a better deal hopefully), where things wind up in stores via the distributor system. But five hundred Kickstarter sales is probably equivalent to at least five thousand in the regular market. Economies of scale mean you need to sell a lot more just to break even. I’d say Kickstarter isn’t for everyone. Not everyone enjoys business, not everyone enjoys interacting with people (yes, you still have to deal with disgruntled folks when things get late on a Kickstarter) and, last but not least, not everyone enjoys packing and shipping hundreds of books out. But if you do, well, it’s pretty much a path to true independence to creatives that do. I felt that Tome, a kind of anthology where every element — down to individual pages counts per artist — was wrapped around the design and the complete space the design took place in — the total 200 pages of the book — was a daring experiment in both art and publishing. Are there any other interesting experiments 44FLOOD is planning? Well, Tome was really Kasra Ghanbari’s baby. He made that thing happen. Dealing with artists is like herding cats. It was a mammoth task. I can’t speak of new experiments for anyone outside of me really. I’ve already embarked on the new crowdsourcing thing outside of 44FLOOD, Patreon, which is partly allowing me to produce content and bring folks along every step of the way, before it even gets to the Kickstarter phase for big, collected books. In theory, an IP I create now has 3 phases of a lifecycle. Patreon to Kickstarter to direct market. So far so good. But at the end of the day I’m really going to focus on straight comics for awhile, and straight themed art books of my own material — Blackholers, a Patreon comic, and Little Devils, an eventual art book of the 72 Demons of the Goetia. I know the other guys have some things up their sleeves too, but it’s not for me to say. Everyone you have ever worked with are the forced participants of an alcohol-chugging marathon drink-til-you-drop shotathon. Who’s the last man standing? The Squidder #1 by Ben Templesmith, 2014. A topic I always want to talk about is digital comics. Just like any other medium, Internet and the computer age have permanently altered the comic book terrain, from creation to publication and from advertisement to distribution. How do you think this has effected the industry in general, and how do you see it continuing the change the arena as the years move forward? Will digital comics ever surpass the print format, either in numbers or prestige? I honestly don’t see it doing too much in my general sphere of comics. Anyone can technically do a comic and put it online now, which is great. But the nexus points of where people know to go and get them is pretty limited and locked up by big players. Same as the regular publishing industry, except if you go via the regular chain, there’s even more entities taking a piece of the pie before you get to the creatives, from my rather basic understanding at least. I mean, there’s the regular publisher that takes a cut, then say, Comixology, iTunes and probably something else I’m missing, before the creative gets a percentage. I’m also not up to speed on if comic sales have been exploding now that you can read them digitally. I’d love it if they were, to offset the further layers of middlemen though. All I do know is I’ve put one up for free. Asked folks if they want to see a bit earlier than the general public, to help fund me doing it, and they get a print edition at the end. So far so good. No one is getting rich but I’d say it’s worth it so far, especially on the emotional level. Perhaps sometime I’ll use the new webcomic nexus points to get the work out there further but I’m one of those horribly stubborn independent types. I always try my own ways first. No, I think the actual books will always be there. Even if just as a fancy fetish item. I always want to make artifacts. I totally get that going digital saves space and that’s fine by me. But if I find something I love, I’m going to want a hard copy of that work at some point. I know a lot of people who feel the same. I’d like to extend the previous question in terms specifically of social media. You seem to be very in tune with social media and use is effectively. There’s still a lot of value in finding new books just by walking into a comic store and seeing what’s on the rack that week, but social media has been creeping into that territory as well. How has social media been important or useful in the marketing of your work, especially in relation to the crowdfunding campaigns by 44FLOOD? Me? In tune? Heh. I’ll take your word for it! I tend to just blurt out what I think and like showing behind the scenes/works in progress. I’d say social media is crucial to the connection with an audience, either old or new, especially considering whatever “new” comics in a store (except for the really good ones!) are very beholden to the direct market distribution system. The sheer amount of new and interesting things online will always beat that gateway. And success online often eventually translates to the other anyway. For me, it’s all about being an actual human online. I’m not there to do anything but be myself first. And if folks like my work on top of that and look me up enough to buy something off me, then even better. Comics folks were the trail blazers of the current internet. I think a lot of people forget, we adopted Twitter very early, so too with Instagram. before the Kardashians shat all over it with endless duckface selfies. It doesn’t matter where you are, or what medium you choose, the only thing that really counts is authenticity though. I guess that didn’t answer your question in relation to 44FLOOD. But then, I haven’t really done the social media for it as an entity. I just use it as an “authority figure” I then share the info from and vice versa, and they retweet and share what I do. Mirrors of each other I guess. You’ve been considered one of the most celebrated artists in horror comics and for years, your name has been more or less a guarantee for horror fans. With that kind of prestige, it’s surprising to hear one of your main focuses is a free webcomic. What can you tell us about Blackholers? Thanks for nearly making me spit my drink out. Me? Most celebrated? Well, I might disagree with the phrasing, but I guess I’ve been around long enough that folks have gotten to know me and I’ve developed a relatively sustainable audience. There was a period where I didn’t do any real comics for two years and yet I still had amazing people come up to me at cons. But now I’m back and people apparently aren’t sick of me yet. I still think about that every day. I don’t take it for granted. Blackholers is an experiment. And a way of giving back. It’s not about money, but paying the rent is becoming rapidly more crucial! 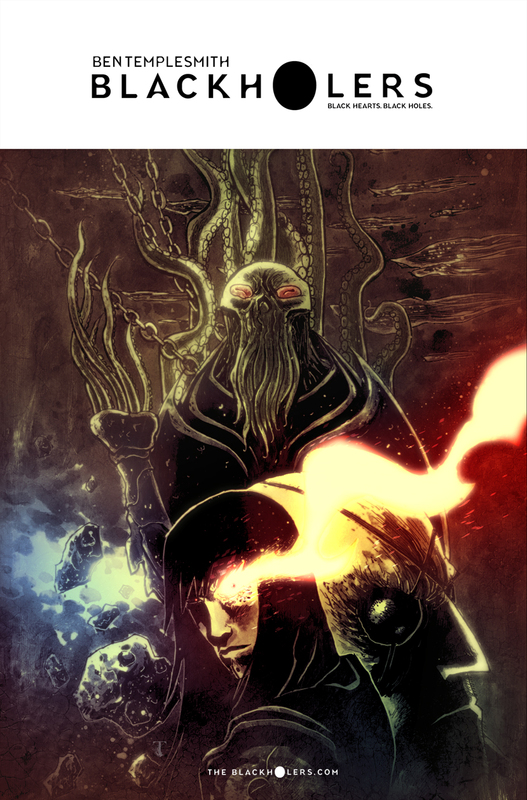 So yeah, it’s a free science fiction comic, over at www.theblackholers.com which is really just a blog. Two pages a week. It’s about a former slave of some squidly race, now basically a space pirate/mercenary who’s always on the look out for revenge against her former masters. They took her eyes so her current ones are bionic. Plus, it has sentient slugs in it. It gets messy. I’ve not even gone all fancy with it, though I’d love to if I can afford to get someone to build me a fancy webcomic interface. But patrons on my Patreon get to see it all a month in advance, plus all the work in progress, videos, and then ultimately a print comic at the end. So the first lifecycle of the book will be free webcomic, audience financing to make it, then sell a print comic of each issue as I go — bulkier than regular monthly comics mind you, with extra stuff — and then perhaps a big collection at the end. And then, who knows, maybe a direct market version ultimately. So far the proof of concept is working. It’s basically paying for the time it takes me to do it. Which is amazing to me. I really love the business side as much as the creative. It’s all problem solving. It’s all can this be viable or what do people really want. I’m really enjoying the whole bloody thing. The Blackholers cover by Ben Templesmith. I can never seem to think or read about webcomics without thinking back on Warren Ellis’ and Paul Duffield’s FreakAngels. As a friend and collaborator of Ellis’, did you consider FreakAngels while you were preparing for Blackholers? Actually, not really. Though I loved that. What got me enthused for it was the amazing work of Daniel Warren Johnson with his Space Mullet webcomic. My model and plan was to definitely incorporate Patreon into it though. Your Patreon seems to be mostly geared toward Blackholers, but there are a lot of other perks for subscribers as well. How has Patreon improved the creative process? Patreon is really a game changer for me. It forces me to be accountable to the actual audience, plus I get their feedback, which creates a wonderful vicious circle of productivity. It’s not just for Blackholers, though. I’m also slowly producing an art book through it, called Little Devils, reinterpreting the 72 demons of the Goetia, an old 17th century book I do believe. Plus, other random things I get to do at times that I let them in on. Essentially it’s a real club of sorts. I have some other books I’m going to show them soon, too. They basically get to see everything I do before the world does, if ever. It’s a mini Kickstarter, but at the same time very different. When I look back at the properties you created or co-created (30 Days of Night, Welcome to Hoxford, Wormwood: Gentleman Corpse, even The Squidder), they all seem to have relatively short lifespans. Would it be correct to assume you prefer shorter limited series over lengthier ongoing monthlies? In terms of narrative, how would you consider the two formats to differ? What would it take to get you to want to work on a long-term project? I think they make more sense, both creatively and financially for me. I’m really only good for 4-6 issues max before I need a break — who wants to draw the same thing for years on end? I admire folks like Greg Capullo for their stamina! But at the end of each miniseries, it’s enough for a good trade paperback. I mean, I can do more, sequels etc, but this allows me breathing room. That’s why there’s 3 volumes of Wormwood currently, though I’m working on a fourth now. In an industry still filled with fifty-year-old characters on issue runs that span into the decades, that’s just not the sort of stories I’m interested in telling much. And new books, that plan on such massive stories, that last years, well, not everyone can do that. There has to be a real spark of something for a book to last 50 issues or so. I’ll stick to smaller things that can be part of larger things, perhaps! So, I don’t think anything could get me to commit to projects that literally take years. Not the traditional way at least and not as a creator owned thing. Bite sized chunks of story “arcs” perhaps with breathing room in-between, but I’ve never had a dream of being on say, Spiderman for two-hundred issues. Gotham by Midnight vol. 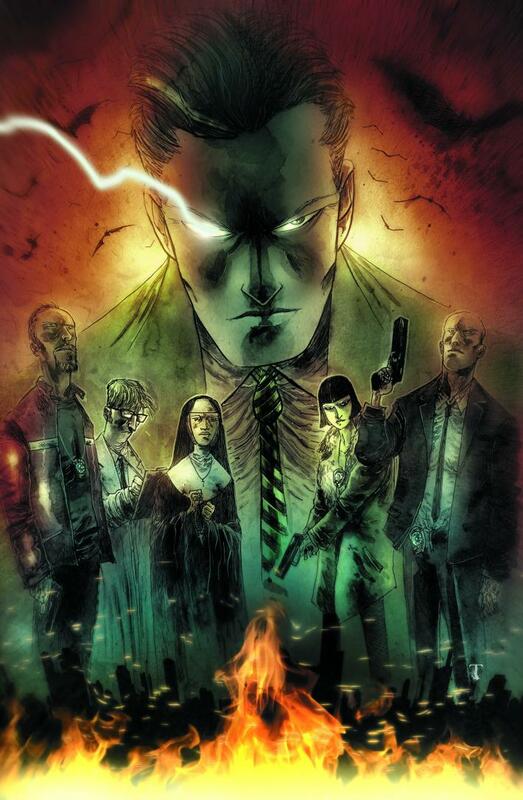 1 by Ray Fawkes, Andrea Sorrentino, and Ben Templesmith, 2015. Anyone with a passing familiarity of your work can tell you have been deeply influenced by the work of H.P. Lovecraft. This influence is seeming to reach its apex in your recent work. First, The Squidder updated the notions of the Old Gods, and now you’ve literally adapted Lovecraft’s Dagon. Why is Dagon the story you chose to run with? I’d say I’m more influenced by everything that came after, and were influenced themselves by Lovecraft. He really is the granddaddy of them all. I chose Dagon because, first, I love the story, and second, t’s short, it’s not massive, and it’s visually amazing for me to go to town on. Third, it’s also got name recognition, and who doesn’t want a stab at a classic? Fourth, it happens to be public domain, as all Lovecraft stories technically are (some parasitic pricks still claim ownership over his later works and someone may just need to have the guts to publish something and have a court find out their claim is now baseless). As you can guess, I’m a big fan of public domain. There’s a reason it exists. Imagine if some arsholes still claimed they owned the copyright to Shakespeare! At least the idiots who thought they controlled the “Happy Birthday” song finally had to let it go. Just crazy. You seem to have had a relatively peaceful working relationship with IDW. Most, if not all, of your original creator-owned work has been through IDW. Us San Diegans are reasonably proud and protective of IDW as our resident comic book house. Even The Squidder, which began its life as a 44FLOOD project, was later run as a serial with the cooperation of IDW. What are the unique conditions that have cultivated between you and IDW that have resulted in such a healthy working relationship? Well, I did do their first actual regular comic book that ushered them into becoming a publisher, so there’s always been a long term existing relationship with them. Hell, I once directly worked in their offices and learned a lot about how a publisher actually works. 44FLOOD has a partnership deal with IDW, so it makes it easy to keep wanting to put out books via them. They’re a premier publisher (at the front of the previews catalog, etc) and have some great reach. Plus, I get to keep all my rights now, which is the most important thing possible for me as a creative now. In 2013, I met Joe Hill while he was promoting his new book NOS4A2. I think there was already talk that he’d be creating a comic book spinoff, which eventually became The Wraith. When I spoke with him, I mentioned how much I’d love to see you drawing his scripts, especially as you both have been IDW mainstays. Is there anyone working today that you’ve been itching to work with? Joe is a glorious chap. Always says hi to me when I’m stuck behind the artist booth. He’s mentioned a few things over the years but nothing yet has come of it. Who knows, maybe one day, that’s totally up to him. I’d be all for it. I don’t generally seek to work with writers anymore, just with friends or because something is amazing to me. I have a short list of folks I’ve promised I’d do something with at some point if they ever want. I just really enjoy doing the lot myself. Even if I’m not the best writer, it’s a thing I enjoy. But only on my own things. I recently hit it off with a great guy by the name of Donny Cates, so you never know, things are percolating there. But nothing tops Warren Ellis, so my dreams of working with writers and answering that question “what writer would you really want to work with” was actually done long ago! 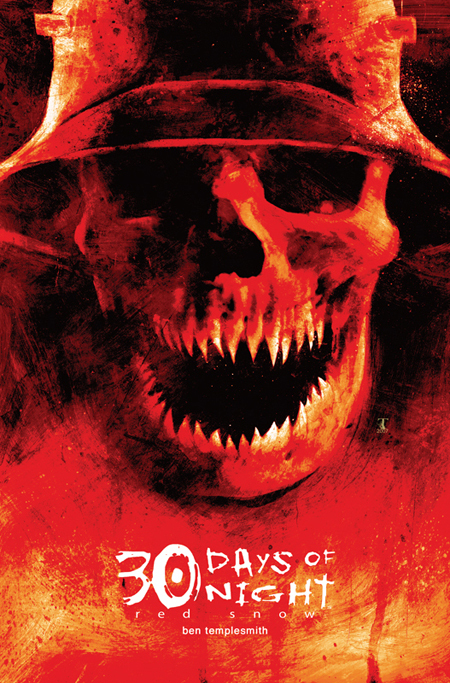 30 Days of Night: Red Snow by Ben Templesmith, 2008. Speaking of Ellis, in 2009, it seemed like Fell stopped abruptly with plenty of territory still to be explored. You mentioned once that a letter from Warren Ellis was partially responsible for your return to comics after your brief hiatus. Is there any chance that letter can evolve into more Fell? Oh, it’s a long convoluted story I guess. As of right now, it’s on me. I have one issue. Was sent to me when I was struggling and committed to other things, so couldn’t touch it for a long time, but now, assuming I can pay my rent, I need to get it done. But then, I’d imagine, he’ll need to write more. And for the longest time I didn’t want to do that to him! But the gauntlet is down now so if nothing else, there’ll be an issue from me eventually, that I can say. And then we can see how long it takes hopefully for more, via the direct market one day perhaps. 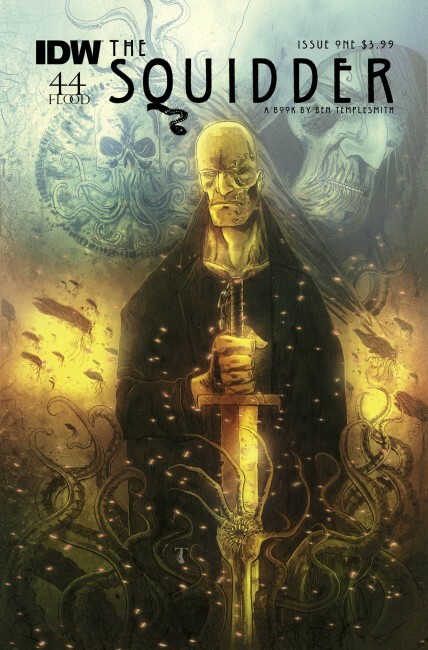 About two years ago, I heard rumors that IDW was in the early stages of creating an animated series based on Wormwood: Gentleman Corpse, but I haven’t heard much since then. Can you provide any insights? I can confidently say I know as much about all that as the general public at this point. I’m not involved in it in any meaningful way to know much. Sorry! One of my favorite memories of 30 Days of Night was the cover for 30 Days of Night: Blood of Christ. If I remember right, that cover was a widely misunderstood April Fools Day Prank. That’s not a question, I just wanted to say thanks for the laughs. Yup. Folks kept asking me when it was coming out for a few years. 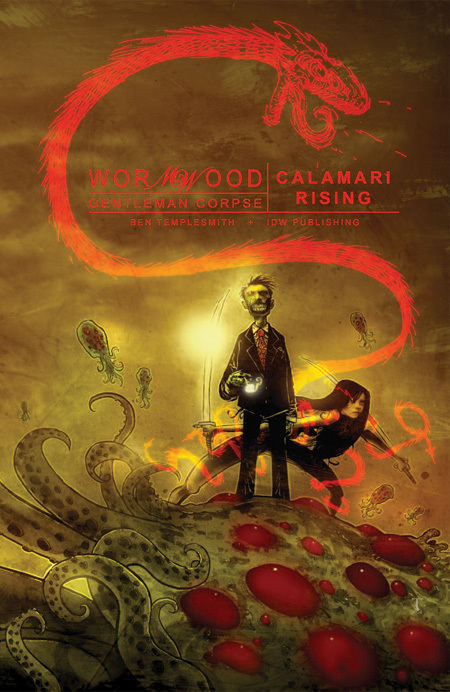 Wormwood: Gentleman Corpse vol. 3, Calamari Rising by Ben Templesmith, 2008. You and Steve Niles were reunited on Lust, another 44FLOOD project. While working on that, did you guys talk at all about your own fond 30 Days of Night memories? Is there an alternate universe somewhere where you two head back to Barrow? Well, speaking for myself, much of my career has been spent trying not to be seen as “the vampire guy” and define myself as more than just that one early, huge book! My last statement on 30 Days of Night was Red Snow, where I finally had the chance to do the art (and writing too for fun!) the way I wanted. 30 Days was among my earliest, rawest work, so I wanted to go back and do it the way I wanted to, since I had more experience under my belt. Can’t deny it would be fun again but that story was originally a single thing, then evolved to a trilogy or sorts, and then… so many spinoffs. I didn’t do any of them because I never signed up for that sort of thing really. Perhaps I like making life harder for myself. I probably do. Whenever I talk to anyone about any kind of media — comics, movies, music — I always urge them to take a dive and look under the fold, because that’s usually where the more interesting stuff is happening. Would you have any comic book recommendations that you feel are being overlooked? Well, Shaolin Cowboy by Geoff Darrow is close to my heart. Really enjoying Devolution right now thanks to the amazing Jonathan Wayshak and Spread, via Justin Jordan and Kyle Stahm. If your life was a graphic novel, what would the cover look like? Oh, it’d have a blank sketch cover so any artist could do what they want on it.